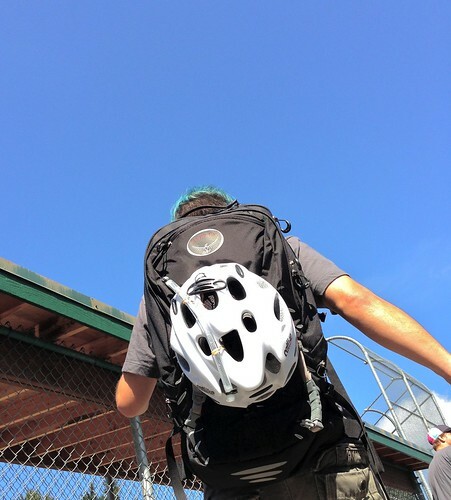 The new Radial backpacks from Osprey are designed to compliment the bike commuter, but the Radial packs have versatility that extends beyond cycling. I’ve had the Radial 34 ($160-170) for several months now, and I keep on finding new occasions to use it. Living in the Pacific NW, whenever I come across a new “technical” pack I generally first consider whether or not it is “waterproof”. It turns out that nominal waterproof-ness isn’t the end-all-be-all for bags. Sure, my faithful Reload messenger pack has a waterproof liner, but a commuter bag like the Radial can keep sufficiently dry with just a lightweight rain cover. 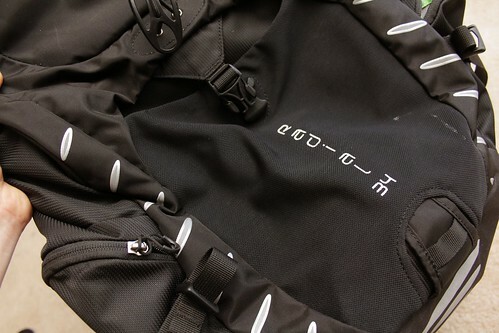 A commuter generally isn’t repeatedly reaching into the bag like a messenger would, so he doesn’t need waterproof and ease of access both at the same time. Those heavy-duty liners in messenger bags really add weight, while the Radial 34’s rain cover is a negligible mass. Relying on the cover to keep water out allows the Radial to have ton of zippers giving access to various interior compartments. 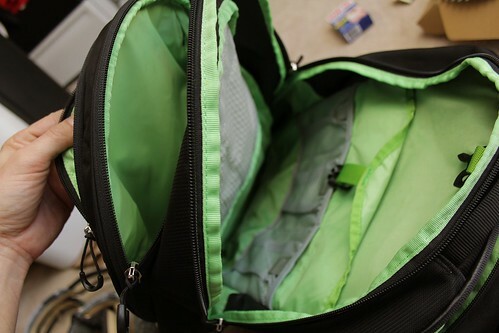 There are three large compartments; the one closest to your back has a laptop sleeve. A smaller one at the top of the bag is perfect for wallet and smartphone plus has a key leash. There is an additional pair of hip pockets, but I don’t use those so much because I can’t reach them while I’m wearing the bag and because the small top compartment lies right next to the main zippers. At the bottom of the bag is a hidden storage pouch for the rain cover. 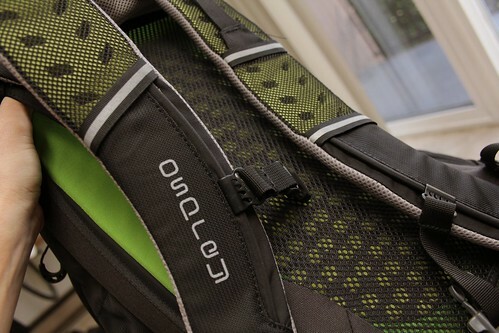 Osprey uses a lightweight but rigid internal frame plus a suspension strap system and mesh to put a little bit of breathing room between the pack and the skin of your back. The supple and well-padded shoulder straps have a comfortable, ergonomic shape. I find that I almost never use waist straps when I wear a backpack, but the Radial 34 has a convenient one if you prefer. What’s nice is that the waist strap isn’t too annoying if you don’t use it. I am really happy with the chest strap however, as it can easily be adjusted for height on the shoulder straps. The “LidLock” helmet clip is remarkably convenient for quickly securing your helmet to the bag. Sure you could just use its chin strap to attach your helmet to any ol’ bag, but then the helmet would be awkwardly swinging around and banging into things. I don’t know about you, but I like nice helmets and I like to keep them that way. Osprey’s LidLock is quick to engage or detach, and your helmet stays put. The Radial 34 comes in S/M (32 litre) or a M/L (34 litre) sizes; I have the larger version. In the end, this bag did not replace my heavy-duty messenger pack. That messenger pack has an enormous capacity, full waterproof liner, and a side lock holster. For the way I am on-and-off my bike, in and out of buildings, my use patterns still closely resemble those of a messenger. But I have really come to appreciate my Osprey Radial. It is a very convenient size, and compare to my messenger pack it just feels like there’s nothing on my back. Day trips with friends or shopping by automobile, this is my bag of choice. 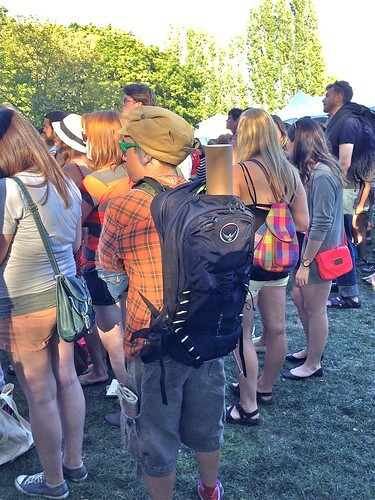 I have taken the bag to music festivals. Standing on tip-toes to see the music stage for three days straight would have been murder on my back with any other bag, but the Radial 34 suspension system is comfortable even after hours of wearing. Currently, I’m using this Osprey pack as my race-day bag. The various compartments keep everything organized and me stress free for cyclocross races. I have a compartment for my shoes, one for my race clothes, one for my post-race clothes, little pockets for race numbers and safety pins, wallet/smartphone, etc. Along with the rain cover in its hidden bottom pocket, I keep a heavy shopping bag in case I end up with mud and muck encrusted kit post-race. 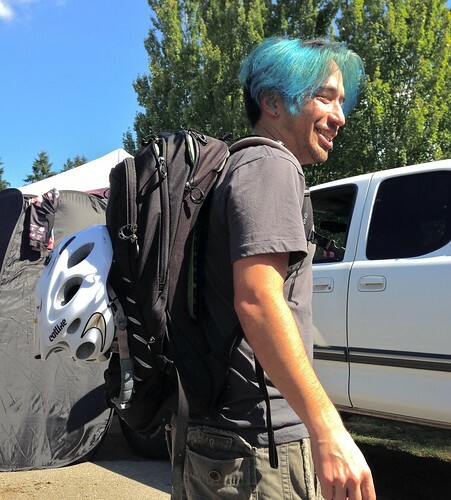 I have used smaller messenger bags (single-strap type), my main messenger backpack, and duffle bags for race day logistics, but they all have their inconveniences. A real messenger bag, with it’s cavernous main hold, just throws everything together and is frustrating because you are always searching for the one thing you really wanted at that moment. A duffle bag isn’t ride-ready if post-race I don’t hitch a lift home in a car. And don’t forget the handy LidLock for the helmet. It’s just about the perfect size for a day of racing; it is my trusted companion as I get ready to jump into the fray of cyclocross’ mud and mid-corner pileups. I do use it occasionally while actually riding a bike, depending on what I’ll be doing when I get to my destination. The Radial 34 is comfortable on my back and secure while riding. In fact I have several times done my CX course pre-ride while wearing the pack, so I am sure you could use this bag for real mountain biking too. One limitation about the internal frame of the pack is that this M/L Radial 34 often hits me in the back of the neck while on my road bikes. I think this is a combination of my shorter stature, larger pack, and the low height of my handlebar which means I have to angle my neck up a fair bit, putting it into the top of the pack’s frame. Perhaps on a mtb bike I wouldn’t be hunkered down as much, but on a road bike I wouldn’t want to ride for hours like that. Also, the various compartments of the pack make it suited more for many small items rather than large, bulky single objects. 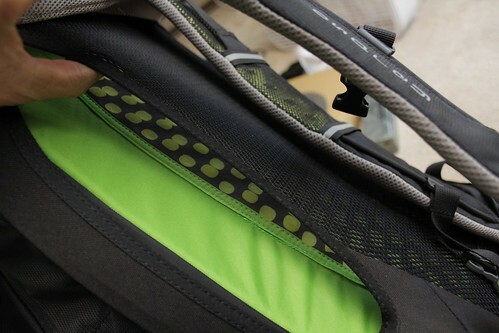 However, for a load of equal weight the Radial beats the stability of any over-the-shoulder messenger bag. Osprey Radial 34: my companion for three days of Bumbershoot!